Make sure your hard drive is shredded into minute pieces when you’re thinking of disposing computers and other electronics. You don’t want people snooping into your information. Call us and we will handle it for you. When you want to get rid of electronics, think about the environment. Take electronics to a recycling facility. Better yet, call us and we will schedule an e-waste pickup. Computers are made of hundreds of minute parts ranging from aluminium, plastic, copper and others. Think of these when you try to get rid of computers, because these can be reused. We have a team of experts that can take apart a computer for you. Are you afraid your personal information will reach the hands of other people? Our company has an advanced mobile facility that handles on-site data destruction. You watch while we destroy. We dispose obsolete and unwanted electronics in a secure and ecological manner. Our team of experts will streamline the disposal of IT assets. The team will also try to recoup the loss. Part of business crucial matter is keeping the information in tight security. Deleting files doesn’t really destroy the files. They are just kept on the hard drive. This information is prone to easy access or retrieval of fraudulent individuals. Proper destruction of your files is necessary to get rid of the information. Fort Wayne Hard Drive Shredding provides a professional way of destroying such files. Shredding destroys the hard drives in a way that not even single information can be retrieved from its debris. The material is destroyed physically and sure to be safe from the negative effects towards human health and the environment. Fort Wayne is a populous city in the Indiana state. The city is highly industrialized and possessed magnificent landmarks and buildings. 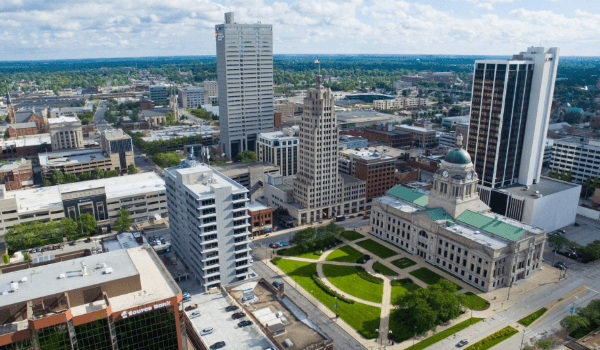 Fort Wayne is a comfortable place to dwell in and is perfect choice for you to invest in business. We aim to respond to the needs of technological waste management. We provide devices disposal and recycling of the materials. Part of our numerous list of services is the hard drive shredding. This greatly helps businessmen and even individuals to destroy their no-longer functioning computer’s hard drive to secure that information will not leak or be recovered by others. All Green Electronics Recycling is the forerunner of giving the best quality service in technological waste disposal and management. We are continually making new and modernize method of handling technological materials with efficiency and safety. Our expertise and experience in the field helps us to build a credible and trustworthy name in the technological waste management industry. The Fort Wayne Hard Drive Shredding is an example of our commitment towards quality service. This is an innovative method of destroying hard drives to keep sensitive information away from being scammed. We are always ready to respond to your call.